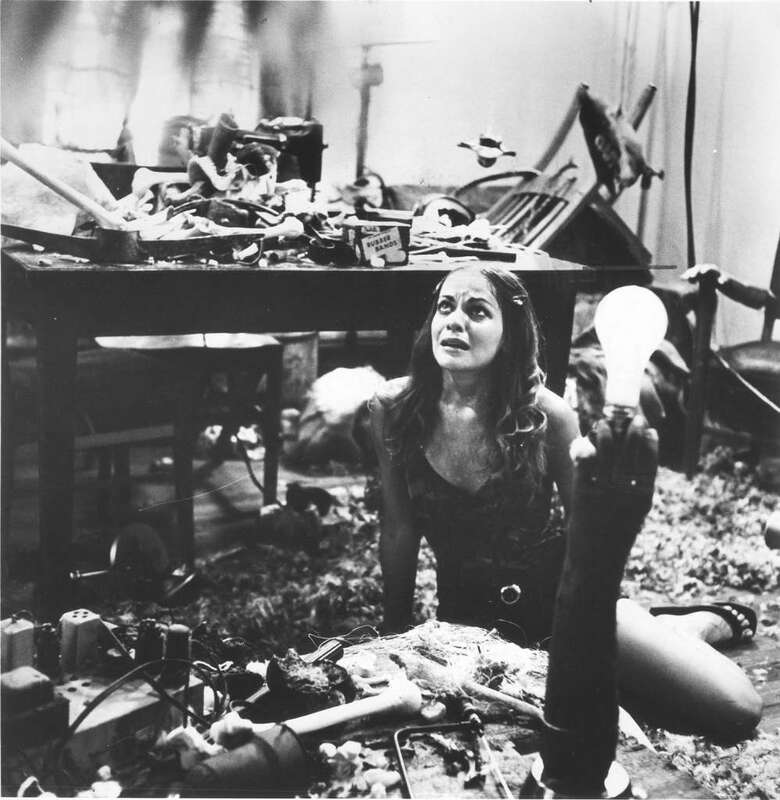 Tobe Hooper's THE TEXAS CHAINSAW MASSACRE (1974) is one of the greatest, most terrifying, and influential horror movies ever made. Its uniqueness lies in its power to manipulate the viewer into thinking they've witnessed far more than they've actually seen. Nowadays, nothing is left to the imagination. In the landscape of horror, a lot has changed in the 45 years since the SAW roared across theater screens around the world. 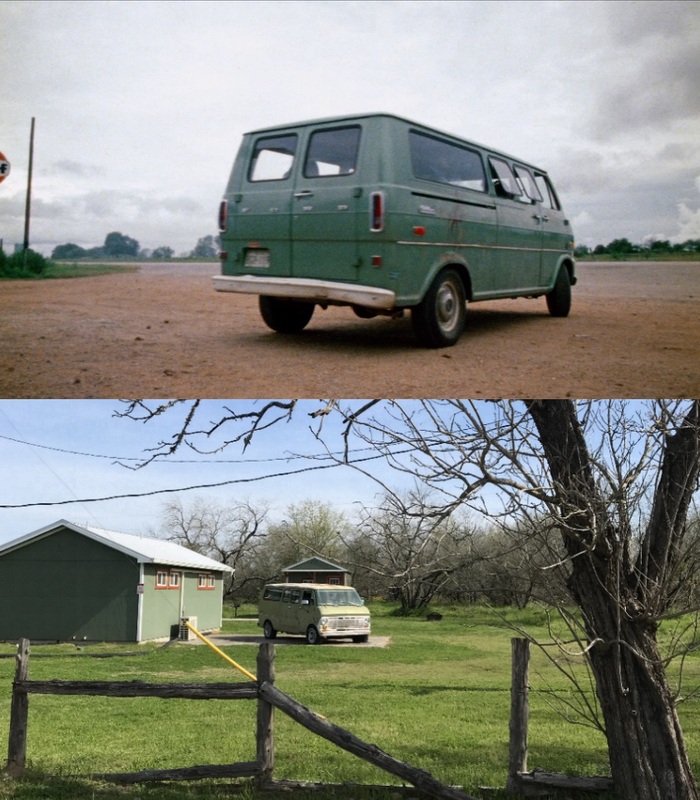 What hasn't changed is much of rural Americana where Hooper and his crew shot the movie. 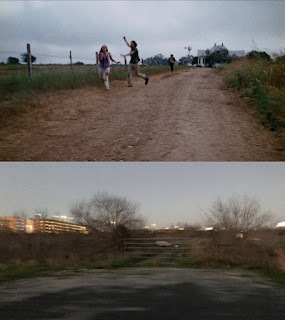 Traveling through some of the bucolic areas of Texas is like stepping into a time warp--going back to the time in which Hooper's Grand Guignol version of 'Hansel and Gretal' was forged onto 16mm film stock. TCM is such a part of the American (and especially Texas) pop culture lexicon, that two of its most recognizable structures have been remodeled for the horror lovers starved for nostalgia and those with an affinity for good eats. 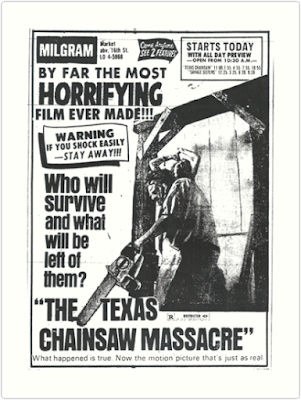 This article is a personal look at TCM and its locations visited on a recent Texas vacation. 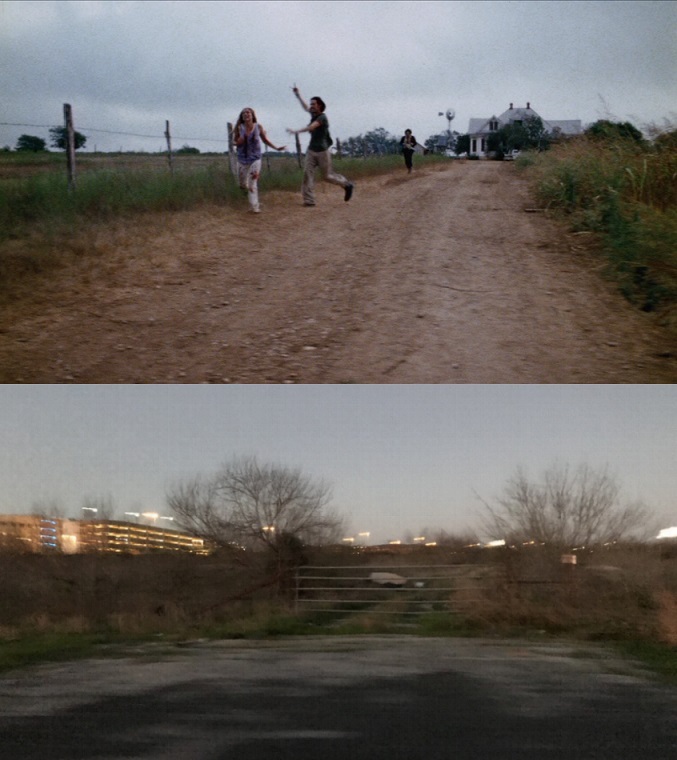 Accompanying the photographs I took are comparative images of said locations from the film itself. But before that, I'd like to divulge how I was first introduced to the 1974 meat movie classick. The first time I saw TCM was in 1984. 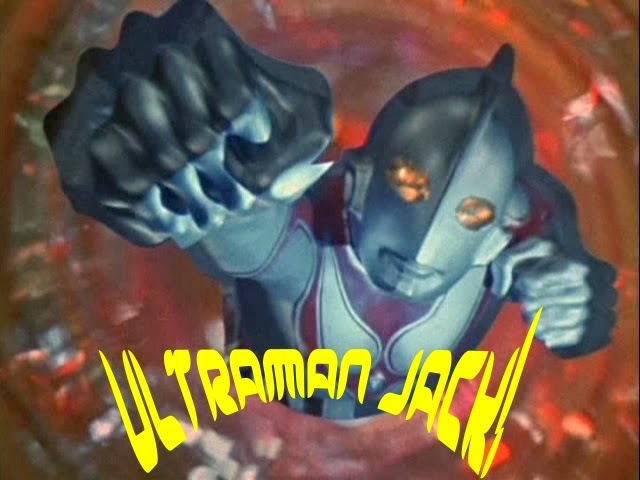 Media Home Entertainment was releasing it on videocassette (Wizard Video had released it the previous year). 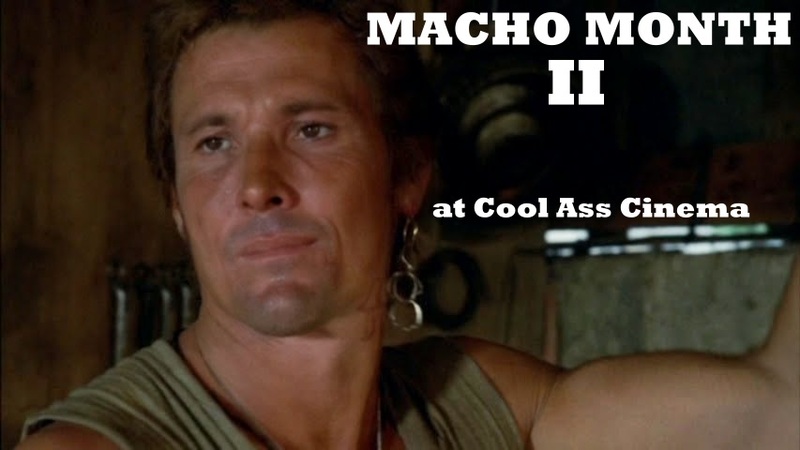 I saw a big poster for its impending arrival inside a local video store called Action Video. I'd first read about the movie that same year in a book my mom bought for me at Waldenbooks in the mall called 'Horrors: A History of Horror Movies' by Roy Pickard and Tom Hutchinson (a book which I still have). 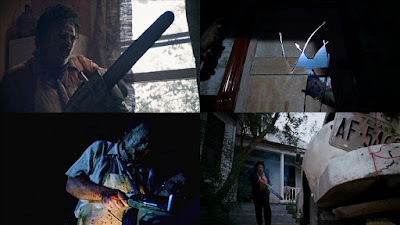 The image (seen below) of a masked, chainsaw wielding maniac chasing a man and a woman stuck in my mind like Teri McMinn being stuck on a meat-hook and never left. 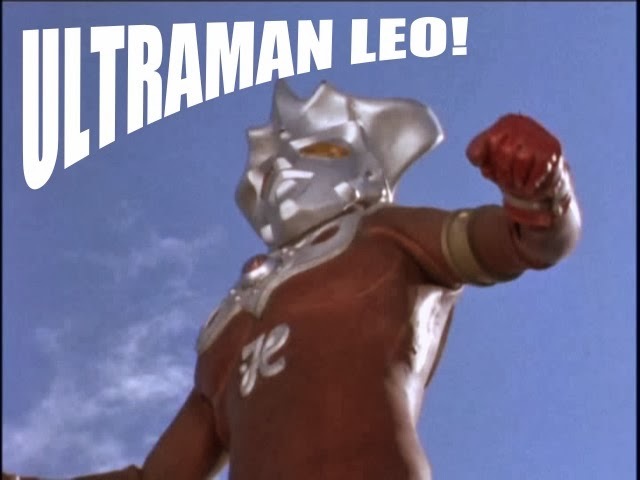 Aside from the visual impression left by what little imagery I'd seen of the film, I heard a lot more about it from family members after asking if they'd seen it. Come to find out, my parents attended a theatrical showing back in 1974. My mom isn't a horror fan, but tried being a trooper by going with my dad to see it and, predictably, it didn't make her 'Best Of' list for the year. She told me the movie unnerved her to the point she had to go sit in the lobby for a while. Regaining her composure, she decided to go back inside to try and finish the flick with my dad. However, once Grandpa began sucking the blood from Sally's finger like a baby to a bottle my mom had had enough--once more returning to the lobby where she remained till the film was over. Needless to say, my dad enjoyed the movie so much, he returned to see the film again by himself. 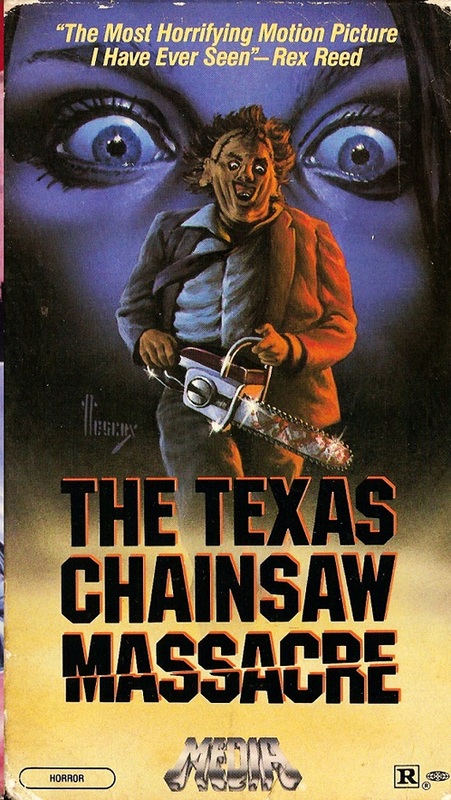 I remember being transfixed not only by that mind-melting image in my beloved hardcover book of horror films, but by that video store poster. The title alone evoked images of brutality the likes of which my mind couldn't comprehend. 'Texas' with its reputation for being a wild n' rowdy place where everything's big from belts, to boots, to ten-gallon hats; where people perspire profusely--the sun-baked sweat sticking to you like jam; 'Chainsaw' being a loud, terrifying power tool that can slice through human flesh like a hot knife through butter; and 'Massacre' eliciting disturbing imagery of some savage slaughter-fest. When you're a 9 year old with a wild, vivid imagination, something bearing the name of 'Texas Chainsaw Massacre' is too hard to resist. 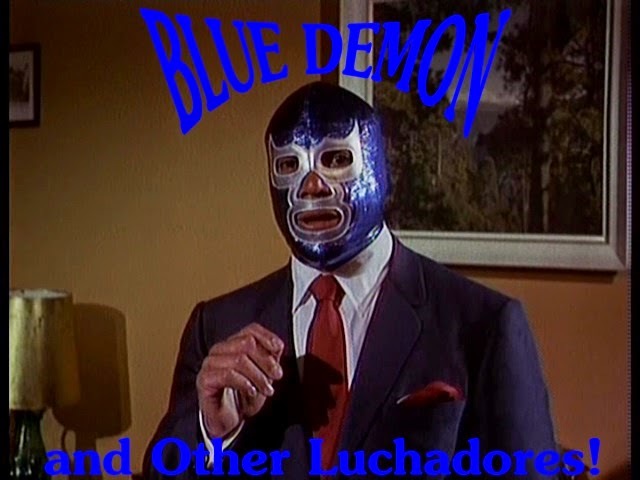 The filmmakers couldn't have settled on a more unsettling title. When we left the video store, I let my dad know I wanted to see the movie. Despite having then viewed some characteristically gruesome horror at that time, his response to me was, "Why would you want to see something like that?" 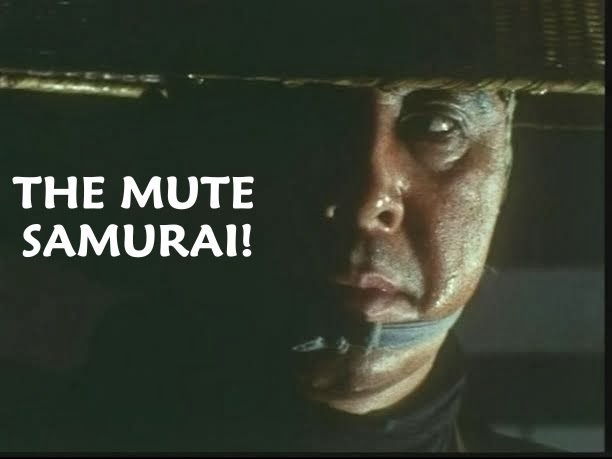 When I did finally see it, I was somewhat disappointed by TCM. I'd been under the impression there was this incredible amount of gore in the movie (it was featured in John McCarty's seminal 'Splatter Movies' book; a book I coveted but didn't get to buy till years later). I also remember being frustrated with the VHS being awfully dark--barely able to make out what was happening in some of the death scenes. 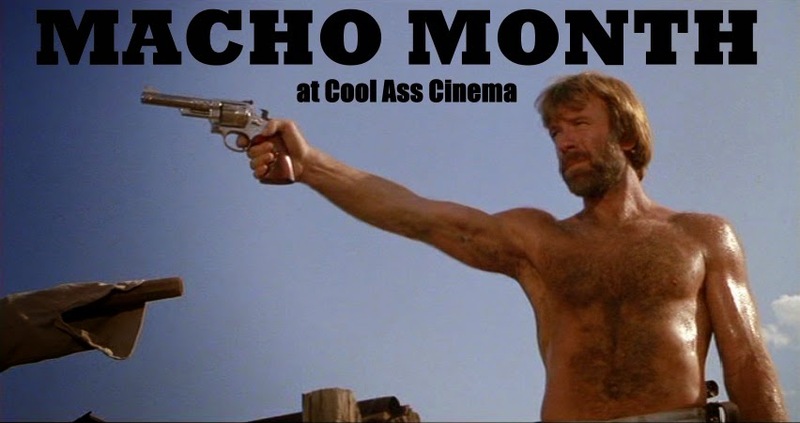 Needless to say, my little-league self was curiously underwhelmed but had no problem being braggadocios about having seen this notorious motion picture. That same year in 1984, I saw PIECES on VHS (it played in my small town for a week back in 1983) and felt like that was a real Chainsaw Massacre in comparison. 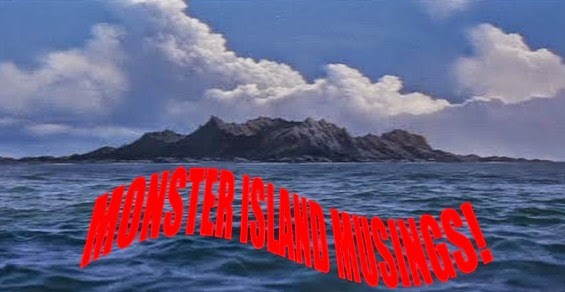 However, watching Hooper's movie over the years, it quickly improved for me and I eventually came to greatly appreciate his vision for the nightmarish classic it is. I can only imagine what it must've been like to see the movie during its original release, experiencing the visceral horror and controversy first-hand. 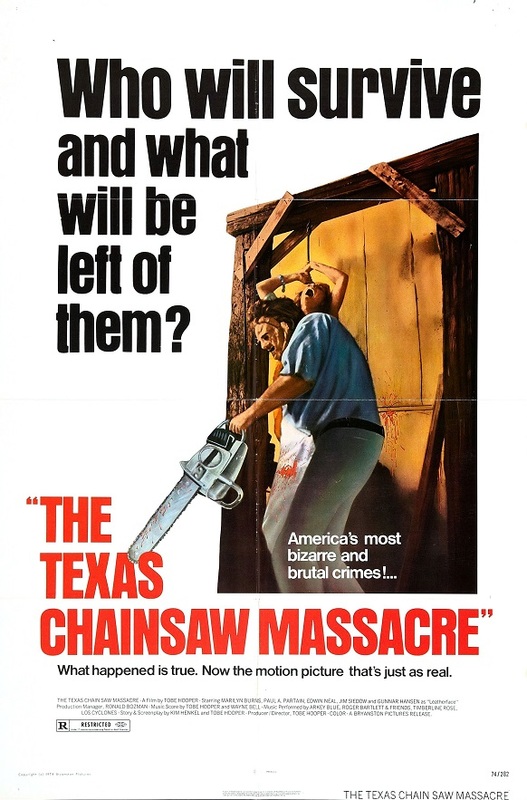 And as much as I came to love Hooper's greatest achievement, the aforementioned Texas vacation to see some of the shooting locations has only increased my adoration for THE TEXAS CHAINSAW MASSACRE (1974). Since 1974, the iconic gas stop where Jim Siedow's Cook character sold gas and human BBQ became a roadside grocery store; then Bilbo's Texas Landmark before closing sometime in 2006. A decade later, the location would receive a lavish makeover--transformed into retro-heaven for horror lovers. An Ohio businessman named Roy Rose (along with his wife, Lisa) bought the decaying fuel stop and partnered with Ari Lehman--a name horror fans will know as the actor that played Jason Voorhees in the first FRIDAY THE 13TH (1980)--to create a novel, one-of-a-kind horror resort. 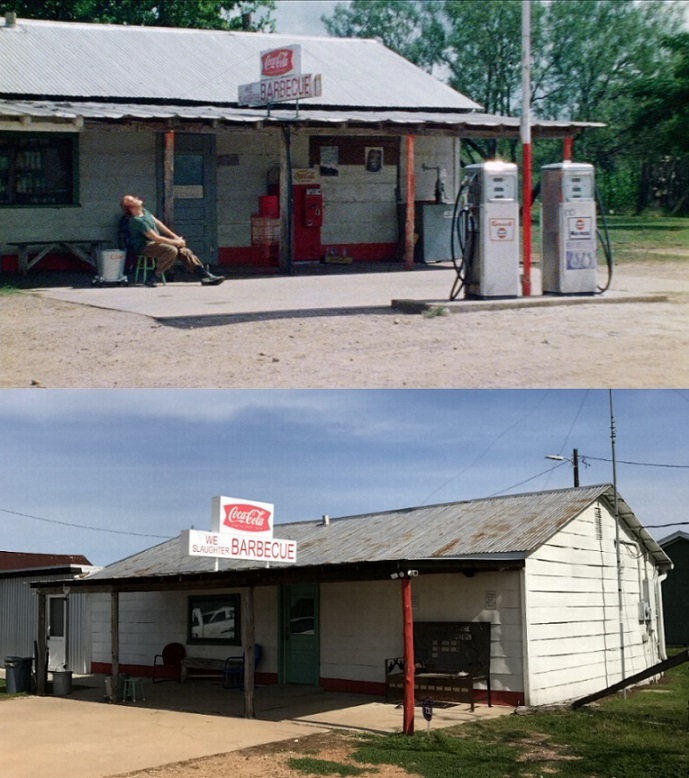 Prior to its public opening, the iconic Bastrop film location was reported to bear the name, 'We Slaughter Barbecue'; the owners eventually settled on simplicity with 'The Gas Station'. The Gas Station had its grand opening October 8th, 2016 with hundreds of horror fans and curiosity seekers waiting near three hours to get inside to take a gander at, or purchase, a wide array of memorabilia from CHAINSAW and a variety of other horror favorites. Edwin Neal, the Hitchhiker from the original movie, attended the opening with SAW 2's Caroline Williams appearing that Halloween weekend. If you're feeling adventurous, you can spend the night in one of four cozy cabins out back or set up a tent on the campgrounds. Additionally, there's a large patio and the occasional outdoor movie night. A music venue was announced as one of the site's future attractions. You can see a glimpse of the area behind the filling station in the insert photo. Elsewhere on the grounds, a van sits to the right of the establishment--the only one that could be found that's nearly identical to the one in the movie; the difference being it doesn't have the sliding door. Incidentally, the farm across the street appears unchanged all these years later. 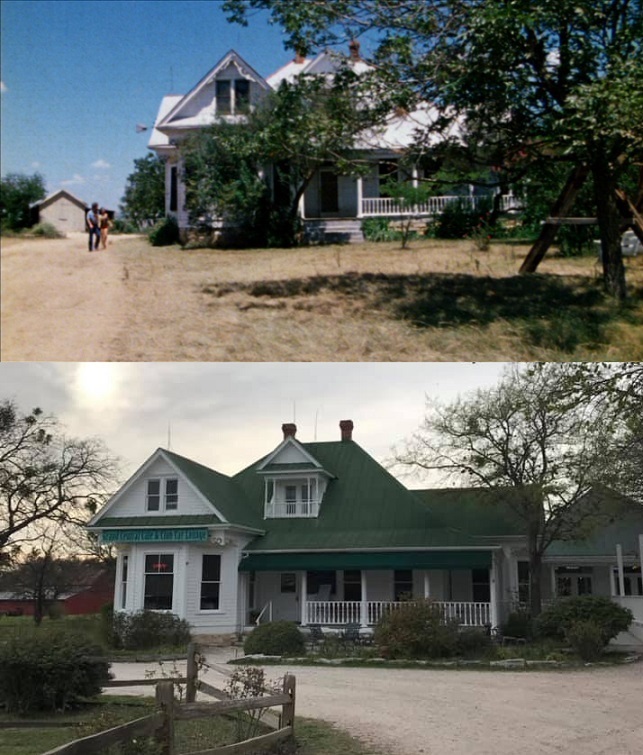 Additionally, behind the service station is the wooded area where Sally was relentlessly chased by Leatherface shortly before running into the cook. When the famous gas stop first re-opened for business, the accent was on movie memorabilia. There's numerous T-shirts, masks action-figures, posters, signed photographs, and any number of other horror-related items inside the place. The smokehouse soon followed and The Gas Station is now home to some of the best, juiciest BBQ you'll ever put in your mouth. Interestingly enough, a few Texans told me how much they loved and preferred North Carolina BBQ while their own brand of brisket left as big an impression on me as Hooper's movie and seeing the areas where he made it. The gentleman behind the counter told me that on one particularly eventful day, they had visitors from every continent except for Antarctica. He also told me a funny story about one customer that stopped by and talked at length how TCM was her favorite movie of all time. What the lady didn't realize was that Allen Danzinger (Jerry in the movie) was sitting next to her the whole time she was gushing praise for the movie. A memorial to the TCM family who have fallen has been placed outside to the far right of the establishment. 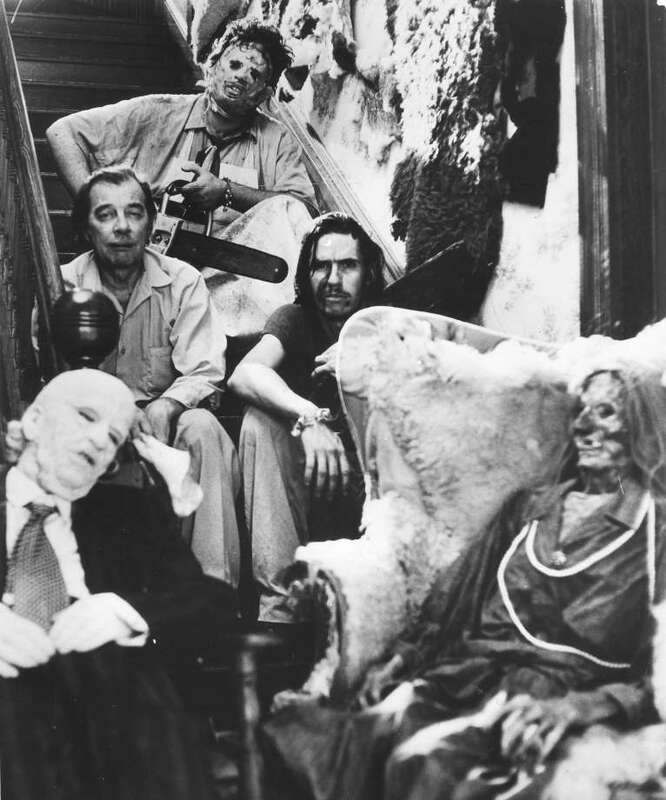 Seated on either end are replicas of a chainsaw, a sledgehammer and a Leatherface mask, the memorial bears thus far seven names of the deceased who worked on the movie--director Tobe Hooper; production designer Bob Burns; actors Gunnar Hansen (Leatherface); Marilyn Burns (Sally); Jim Siedow (The Cook); Paul Partain (Franklin); and Robert Courtin (Window Washer). On a final note, I never realized the gas station sign in the movie read 'We Slaughter Barbecue' till seeing it in person. If you are interested in visiting The Gas Station, stay the night, or eat some delicious BBQ (and you should be! ), you can find information at their website HERE. Built in 1909 in Round Rock, Texas, the Victorian style house was left to deteriorate after filming of THE TEXAS CHAINSAW MASSACRE (1974) had ended. Purchased in 1998 by the owners of The Antlers Inn and Resort, the iconic horror home was cut into seven pieces and moved--approximately 90 minutes away--to the lake town of Kingsland, Texas where it was remodeled and transformed into a restaurant and bar. Now, you too can dine inside the very home where the Sawyer's tortured, cooked and ate their victims. Only now it's much cleaner and far more hospitable without any danger of you ending up as a menu item. 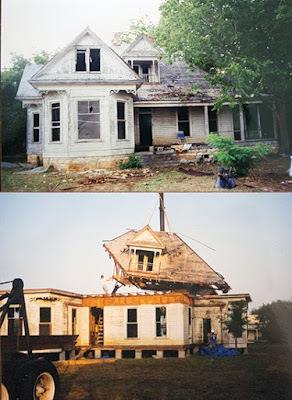 Seeing the original location of the Sawyer house in Round Rock today is a dreamlike experience. In the film, the isolated farmhouse harboring human remains is notable for its lack of modernity. Today, the locale is overgrown with grass and bordered by an ever-expanding Austin industrialization that's in stark contrast to the desolate country roads of 40+ years ago. In the adjoining photo, you can see Edwin Neal and Gunnar Hansen chasing Marilyn Burns down the driveway with nothing but a country landscape. Stitched to that is a picture of the same driveway but surrounded by lights and an encroaching modernization slowly choking away the lack of civilization the area was once home to. Before becoming The Grand Central Cafe, the infamous charnel house went by a few different names--those being The Chariot Grill and The Junction House Restaurant. 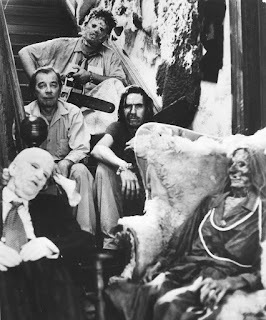 At that time, the establishment embraced its horror roots, having a Leatherface dummy at the top of the stairs. 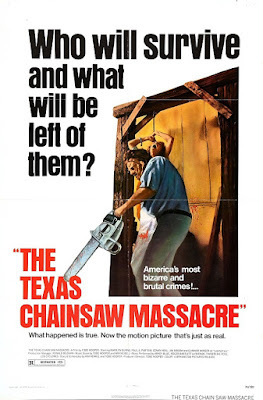 When the Junction House closed down in 2012, reopening the following year as The Grand Central Cafe, the dummy was removed and only a loose association to the movie was retained with a couple TCM-themed drinks on the menu--the 'Leatherface Lemonade' and the 'Bloody Massacre'. Moreover, the menus between the two restaurants were quite different. The Junction offered more comfort food items while The Grand is more upscale. 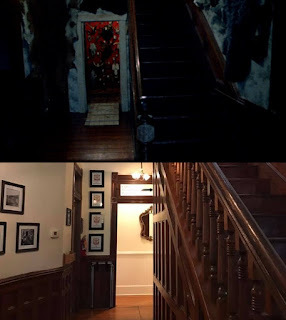 Some changes and additions have been made to the house, but immediately upon entering, a few key locations are unmistakable; those being the unforgettable staircase and hallway leading into the kitchen where Leatherface infamously slammed the metal door after claiming his first victim. You can see a 'then and now' comparison in the insert photo. The place was filling up with customers, but I was lucky enough to snap a picture of the hallway when no one was walking into frame. To the left is the notorious Bone Room; and across the hall is the legendary Dining Room where much of Marilyn Burns' torture takes place. 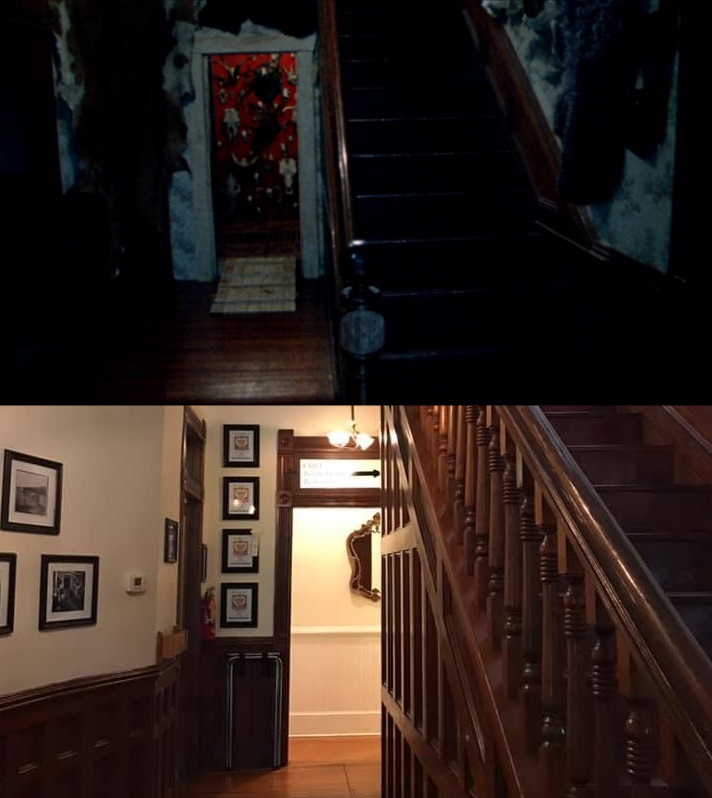 You can see a comparison below of the same room in the film versus what it looks like now. We sat at the table in front of that mural. 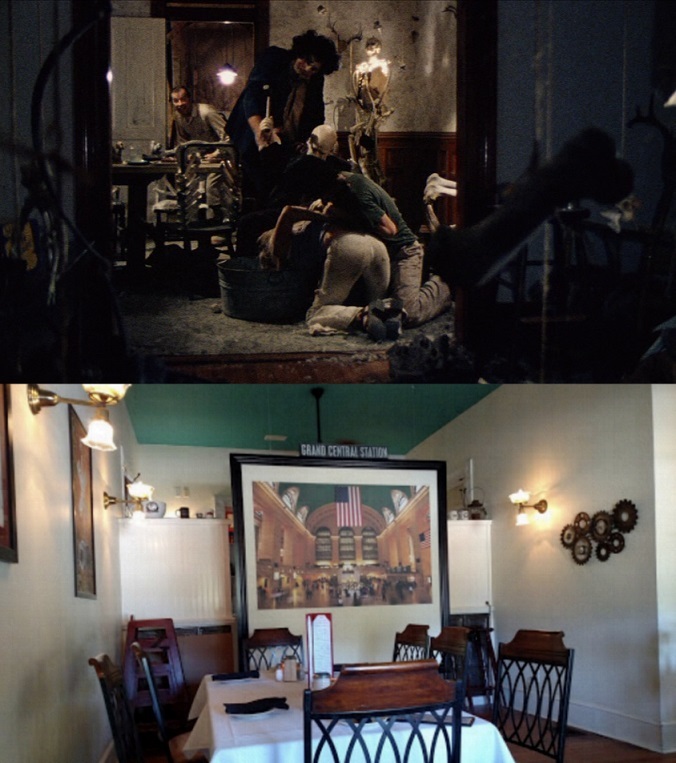 Regardless of where you're seated in the house, if you're a fan of the movie, it will be impossible to not have images of the film running through your mind as you enjoy your meal. As for the food, I had the Hawg Wings appetizer and Surf and Turf (bacon-wrapped filet mignon with grilled shrimp) for the main course. Both were fantastic if a little on the expensive side. If you're interested in dining there (and you should be! ), you can find information about the restaurant, its location, and the menu at their website HERE. 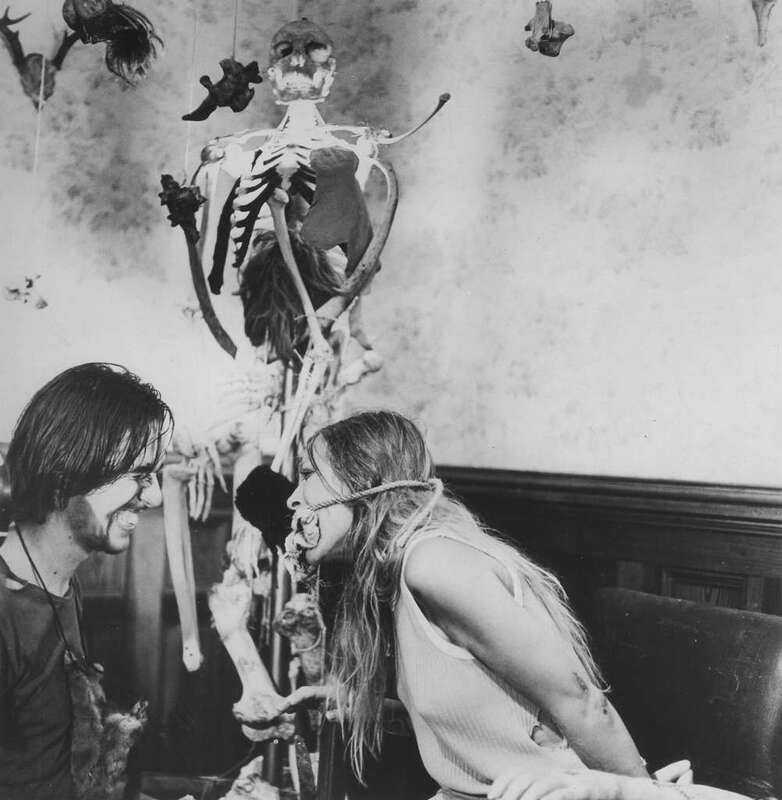 Tobe Hooper's THE TEXAS CHAINSAW MASSACRE is a distinctive motion picture; a product of its time made in a docu-guerrilla style that is impossible to replicate today. It has survived for decades. The Saw shows no signs of slowing down. Like the opening crawl of TCM2 proclaims, "The Texas Chainsaw Massacre has not stopped. It haunts Texas. It seems to have no end." 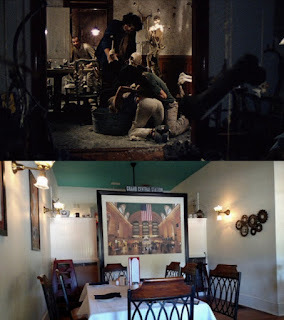 From a fan's perspective, seeing these locations, interacting with them, was a mesmerizing, surreal experience; allowing fans to make some personable memories to share kinship with those previously made in darkened theaters or the comfort of ones living room.